The following article has been written by on of the reader of this blog. Please find below the details. Seamless garment technology is advancement in apparel industry which eliminates the fabric laying, cutting and sewing process. Seamless knitting technology has entered the mainstream in the knitwear market at the end of last century. Seamless entire garment knitting was first introduced in 1995, at the International Textile Machinery Association. This innovative technology was promising to eliminate post labor work. Moreover, it offered knitwear consumers more comfort and better fit by eliminating seams. Therefore, seamless technology promised great benefits to manufacturers as well as their consumers. 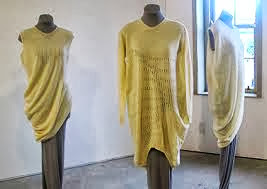 The process for making seamless garments requires the use of cutting-edge circular knitting machines, mostly made in Italy, which complete whole garments based on preprogrammed computer commands that allow for different stitching patterns. The product is a finished or semi-finished garment with no side seams. Seamless technology has transformed the overall worldwide production process, helping apparel firms react quicker to trends because the garments do not have to be cut and sewn. This technology can directly produce finished products, and lessens traditional process of the production. This leads to saving of production costs up to 40 percent compared to the customary knit-ting. Biggest challenge is to educate the consumer about the range of benefits that seamless garments have to offer. With our focus on innovation and quality, producers are constantly developing new seamless styles to meet customer's demand. Development of new fibers and knitting adaptation are continually evolving. New advancements coming from fiber producers and yarn spinners will continue to provide innovation from the supplier side. Based on the structure of the knit, the patterns and construction of the garment cannot be matched with any other non-seamless garment and the ability to combine textures and levels of compression opens up endless possibilities for coloured patterns, jacquards, ribbing and detailing. There are endless design possibilities with seamless technology, with the variety of different stitches that can be achieved within a single garment, for example a jersey knit can be placed side-by side with a mesh knit, a rib knit, a jacquard knit. This is impossible to do with any other type of knitting process. The features of seamless technology benefit the retail store and ultimately the end consumer, who will notice a difference once they try on a seamless garment. Once the consumer wears it, it offers a high-repeat purchase ratio. Consumers are only beginning to understand the benefits of seamless technology. Because of the versatile nature of seamless technology, there are infinite opportunities in the market," both locally and internationally. The seamless concept can be applied to underwear, swimwear, control-wear, leisurewear, sleepwear, ready to wear and active wear. Unlike a regular knitting machine, which produces yards of the same pattern that need to be cut and sewn, the seamless machines produce individual garments from yarn that is fed into the machine-Retails for about 10-15 percent more, because of the specialized equipment involved and the high demand for such limited availability of machinery. This benefit is worthy of a price increase, meaning certain part of knitting/apparel category such as intimate, active wear market can be justified due to above listed benefits since some of its features cannot be accomplished in conventional circular knitting or cut & sew method. The garments are precisely fitted to the body, producing a smother, clean look. Seamless garments conform smoothly to your individual shape and produce fewer lines under clothes to allow for a more streamline silhouette. The softness of seamless knitwear combined with the use of antimicrobial and hydrophilic yarns create the best features for an active wear garment. Wearers love seamless garments because they are forgiving, non restrictive and are not binding. The lack of seams provides for improved comfort as the body moves. With an increasing demand by consumers for more comfortable and better-looking clothing. Seams tend to pucker up, and tags chafe against the skin. Seamless garments feature knitted in shaping to eliminate bulky elastics and provide enhanced comfort. The main seamless products are underwear, outerwear, active wear, shape wear and swimwear, all of which are highly elastic, fine to very fine fabric, made of micro-fibers, required to be very extensible and soft; therefore adding to comfort. Besides offering higher comfort and better fit to consumers by eliminating seams, the innovative technique creates entire garments with minimal intervention of cutting and sewing processes leading to substantial savings in cost and time, higher productivity, quick response, and just in-time production. Seamless garments have no waistband failures, no waistband or side seam failures and are more durable due to the high proportion of manufactured fibers such as nylon. The broad technical application of selective engagement and disengagement can be adopted sensibly to produce a ready to use customized garment thereby reducing wastage of cloth. With traditional production methods, fabric is the starting point for most garments. The fabric is dyed, patterns are cut, and then the pieces are sewn together. If printing or embroidery is part of the design, these are additional steps that take place later in the production process. But with seamless production, there is no fabric. One Italian machine can make the entire product in just minutes; and the machine automatically knits components like waistbands and hems. Seamless garments take 30 percent to 40 percent less time to make than a cut-and-sew version minimizes the traditional labour intensive step of cutting and sewing.